Home Airbrush Spray Tans Hide Flaws! Unlike spray tans or harmful UV booths, our process is safe, convenient and painless. Our custom airbrush mix contains DHA, a sugar cane extract that interacts with your skin’s outermost layer to bring out a natural, healthy brown glow. And we do it in half an hour! 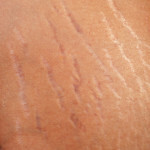 Stretch marks develop because of pregnancy, weight loss or gain, growth spurts or hormones. These red, jagged lines can be alarming when they show up on your skin, but they usually fade to a silvery-white shade. Stretch marks never really go away, although you can cover them up if they bug you. Instead of plastic surgery and expensive skin treatments, take steps to hide your marks with spray tans! Airbrush Tanning helps to hide beauty marks, age spots, and skin flaws! It gives your skin a natural glow that leaves you feeling refreshed! It can also help to camouflage cellulite and stretch marks!